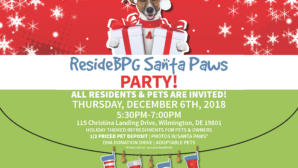 ResideBPG would like to extend a big thank you to everyone who attended our third annual Holiday Pet Palooza with the Delaware Humane Association (DHA). We were able to raise a grand total of $2,282 for the DHA, and four out of five adoptable dogs received applications for new homes! The event, which was hosted at The Residences at Christina Landing, was open to all ResideBPG residents and their furry family members. Guests enjoyed a delicious spread of food and beverages while getting to know with their neighbors from other properties. 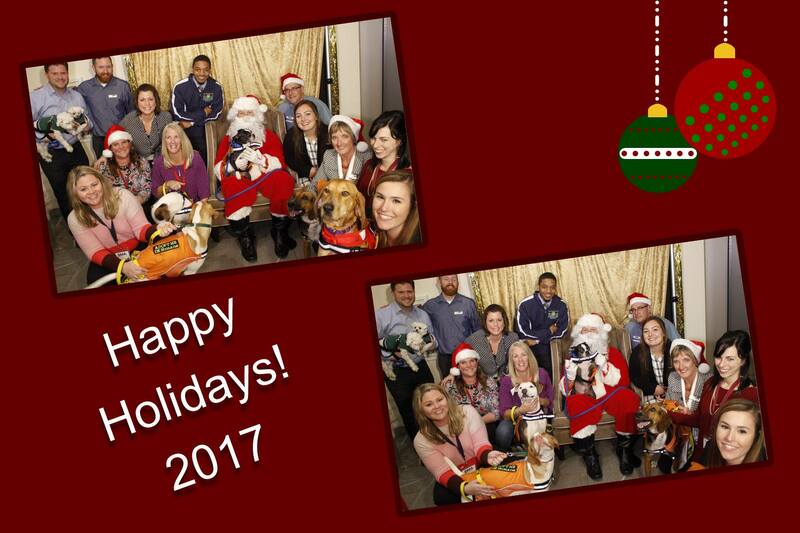 Windcrest Animal Hospital, who generously sponsored the event, was in attendance, along with Riverfront Pets and adoptable animals from the DHA. “Santa Paws” was also onsite for family photos. Additionally, a number of great silent auction items were available to bid on, such as 2 tickets to any show at The Queen, a night stay at the Hotel du Pont, and 2 passes to Longwood Gardens. Thank you to all of our incredible community contributors who donated items, including City Theater Company, Hotel du Pont, Longwood Gardens, Brandywine River Museum of Art, Winterthur Museum, Garden & Library, Target, The Queen, Riverfront Pets, Tonic Bar and Grille, The Grand Opera House, Wilmington DE, CoreTen Fitness, Currie Hair Skin & Nails Riverfront, Bootharazzi, and Penn Cinema Riverfront! Founded in 1957, Delaware Humane Association (DHA) is Delaware’s premiere nonprofit no kill animal care and adoption center, serving a four-state area. They are committed to providing for the needs of homeless and owned dogs and cats in our community. Each year, hundreds of animals come to DHA in search of a warm bed, good meal, and most importantly, a new home. Their dedicated staff and volunteers work hard to ensure that each animal receives the best care possible during his/her stay at our adoption shelter. They’re committed to preparing all adoptable dogs and cats for a new home by keeping them well-groomed, giving them daily exercise and affection, and providing obedience training and any necessary medical care. DHA serves the community by offering affordable spay/neuter services, low cost vaccination clinics, and a pet food pantry. Receiving no government funding, they rely on the support of the community in the form of volunteers, private donations, bequests, grants, and fundraising events like the ResideBPG Holiday Pet Palooza. Click here to make a donation to this incredible organization.